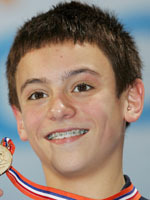 British diving prodigy Tom Daley, 14, had been aiming for an Olympic gold at London 2012, but the surprise qualifier for the 2008 Games will be a media darling out at Beijing due to his tender age, lucidity before the cameras and of course his slick, clean dives. European champion at the 10m platform at age 13 he was already scheduled to take part in the Olympic highdive after qualifying in an event at the Olympic pool in Beijing itself. Daley finished one place ahead of teammate Peter Waterfield, who won a silver medal at the Athens Olympics in the 10m synchronised event. "I am absolutely over the moon," said the schoolboy from Plymouth, who will be 14 years and 80 days old when the August 8-24 Games begin. "My goal for the Olympics is just to get out there and enjoy myself," Daley said. "But I will be aiming to put together six good dives." Weeks later anyone had yet to hear Daley's name may have noticed it with a second set of headlines as he became Europe's youngest ever champion at the 2008 European championships with eight perfect tens edging Germany's world cup winner Sacha Klein into second. He took an interest in diving at seven when his father, an electrician and now his biggest fan, took him to a local pool. By the age of ten he was British under-18 dive champion, earning a 10,000 pounds (15000 Euros) grant from the 'Talented Athlete scholarships scheme". Leon Taylor, Britain's first Olympic medalist in diving for 44-years (at Athens) is his mentor and is cited as Tom's inspiration along with cycling's Lance Armstrong and fellow diver Canadian Alexandre Despatie (who won Commonwealth gold at 13). Even before qualifying for Beijing, the confident, smart and handsome youngster had won Britain's Young sports personality of the year' award at 13, an honour previously awarded to footballer Wayne Rooney and tennisman Andy Murray. Daley has already drawn the attention of international rivals and has won praise from China's coach Zhou Jihong. Asked about foreign divers who had impressed him, he said: "Daley will be 14 this year. I saw his performance at the 2007 World series in Britain. He is talented, with clean executions. The degree of difficulty of his dives will increase as he grows older." The record for the youngest British Olympian was previously held by Fred Hodges, also a diver. Hodges was 15 years and 94 days when he went to the 1936 Berlin Olympics.